I’m a little bit pleased with this effort. 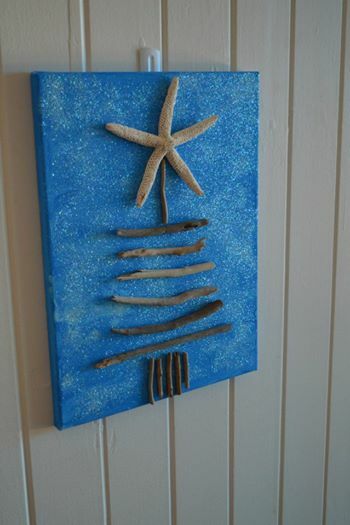 This is my ‘beach shack Christmas’ wall hanging. It’s easy to do and gives a great result, I think. I just painted a canvas (picked up for a few dollars in a cheap shop) and dusted the whole thing with sparkly glitter for a ‘starry night’ effect, glued on driftwood pieces to resemble a Christmas tree, and topped with a starfish I picked up ages ago in a shop at the Noosa Marina. Voila!